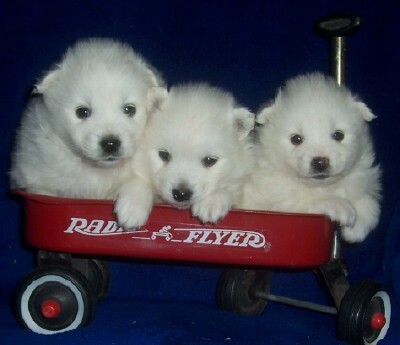 I have been raiseing Mini Eskies, in Central Wisconsin, since 1980. 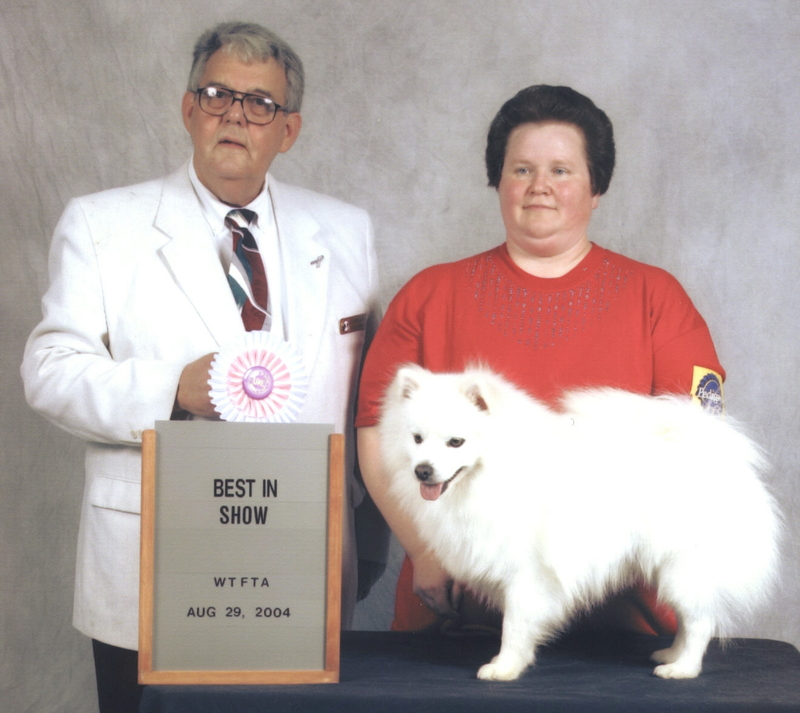 Sno-Pals is the home to multiple UKC Champions , GrandChampions, One National GrandChampion & National Best of Breed. 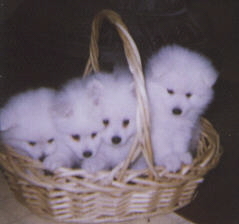 My main emphasis has been on produceing a happy, healthy, companion animal. 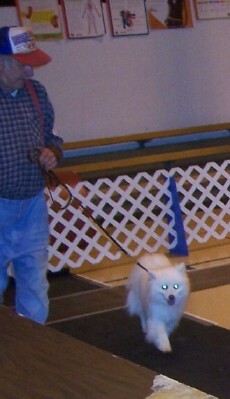 Dog shows are something I do for fun. My dogs are UKC and AKC registared. To raise a pup that you can live with, you must take time to socialize it to new things every week. You must teach it appropriate manners in a human enviorment. 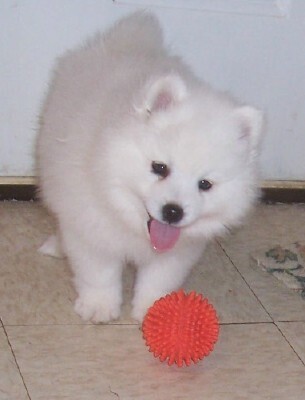 For the inexperienced dog owner, this is best accomplished by attending puppy classes or beginning training classes. AKC Ch. 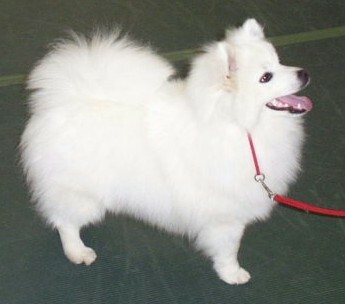 & UKC National Best of Breed National Grand Champion 'PR' Sycamore's Apache Snopal 12 1/2 in. 16# Optigen A (clear for PRA) OFA fair. Elbows & petalla's good. Rainbow Bridge-A SAD day. Apache was bred by Helen Kreger of Belleville IL. 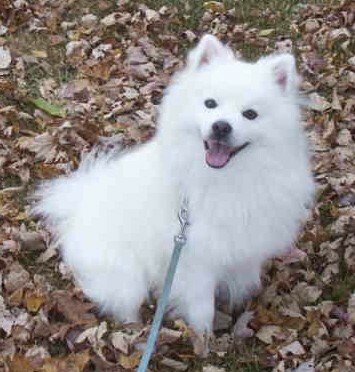 It is a pleasure to own this wonderful little dog. 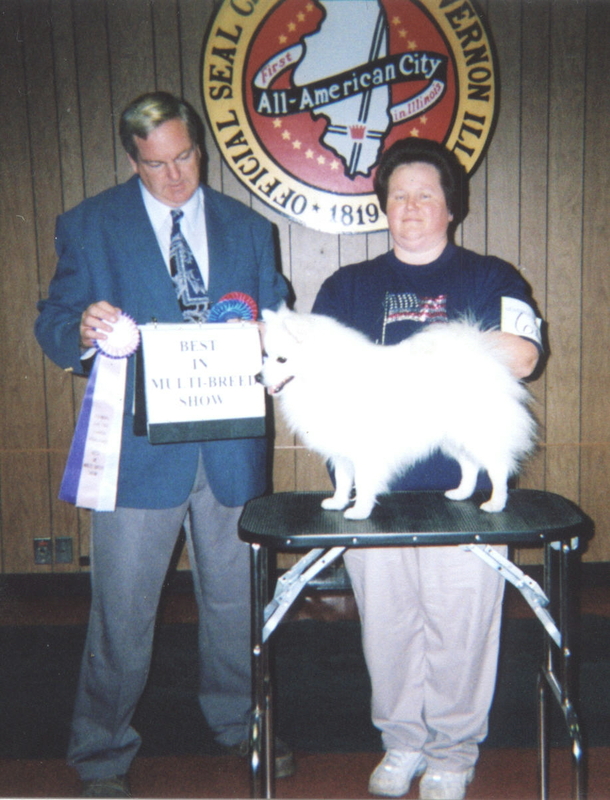 Thank you, Judge Joseph Allen for Apache's National Grandchampion & National Best of Breed Title Oct. 16, 2004 at Centreville, Mi. It's going to take awhile before my head comes out of the cloud, & my feet land back on the ground. In 2010, I finally moved the trophies off the kitchen table & onto a file cabinet. This was a "cool" win, a first for me. A big Thank-you to this Judge who was standing on his feet all day long. 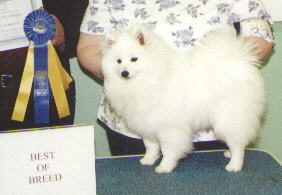 Apache's 5th CH of CH win, which turned into a Best of Show at a Multibreed show. Mount Vernon, IL Oct. 2, 2004. Without this last win, shortly before the UKC Nationals, I would not have went to the National. 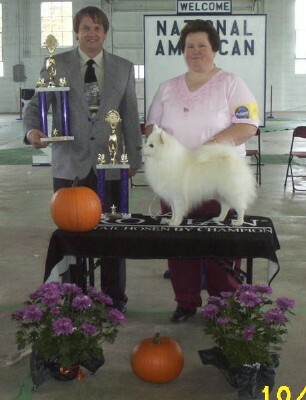 3 of Apache's CH of CH wins were earned at the Northern Lights American Eskimo Dog shows. 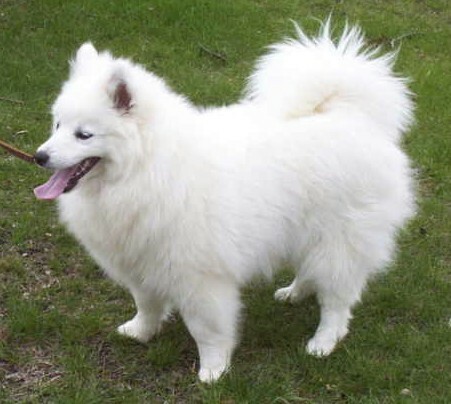 Typically MN has a large Eskie entry. When you can win there, you know you've got a good dog. 1st CH of CH was under Judge John F Davidson April 17, 2004. 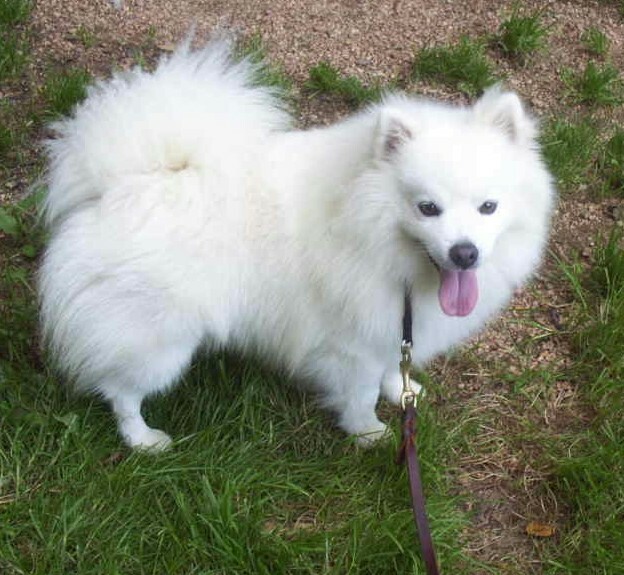 Photo's of Other American Eskimos that have been in my breeding program, over the years, may be found on the Eskie Information page. Mike taking "Happy" around the ring. 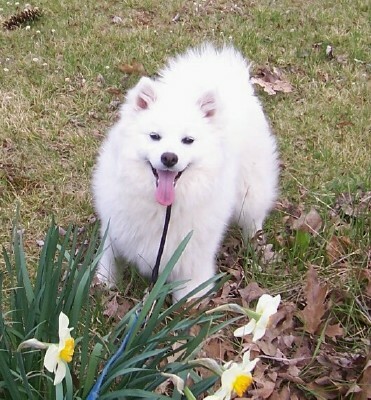 This is Mike's first weekend experience of showing a dog. Considering he had never so much as done a practice walk in a ring, I'd say he did very well getting a couple major wins with Happy. 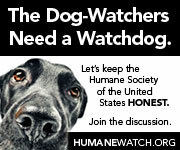 UKC shows offer great support for the novice dog handler. 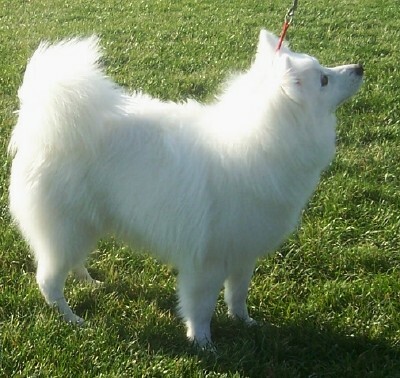 SNO-PALS DUCHESS 13 IN 15# DOB 10/28/15 AKC/UKC registered. 13 in 15 # DOB 9/23/17 UKC registered. 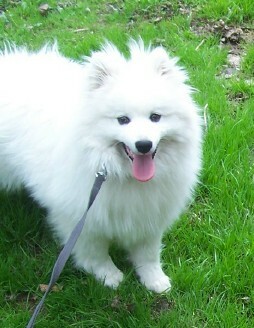 Available as stud to UKC reg females.